With Bigelow teas, a gourmet brew is only a cup of hot water away. Founded in 1945 by Ruth Campbell Bigelow, R.C. Bigelow, Inc. is dedicated to being a premier packer of truly fine quality teas. Each and every tea bag is overwrapped and sealed in a stay fresh foil packet so that all the goodness is protected until you get ready to have a cup of tea. From classics like Constant Comment and Earl Grey to new and delicious flavors, your office will surely be enjoying their favorites. Tazo® is simply a wonderfully delicious beverage that begins when the world’s finest teas are blended with extraordinary imagination. Valley Coffee carries an assortment of Tazo® products including Calm, Zen, and Awake. LIPTON® Tea offers you a large selection of ways to enjoy refreshing, great tasting teas. Choice is a wonderful thing. Whether you prefer yours black or green, hot or cold, LIPTON® has the tea that’s right for your tastes. Discover all the flavorful, refreshing ways LIPTON® delivers the highest quality, delicious tea products. Get delicious hot and iced tea for your Keurig Brewer. Not the coffee type? Pop in a K-Cup of soothing tea to start your morning. Chose from classics like English Breakfast or Lemon Zinger or try a more exotic blend. Need a cold beverage to refresh you in the afternoon? Brew one of Valley Coffee’s many iced varieties over a full cup of ice and beat the heat! Valley Coffee keeps you office chocolaty. 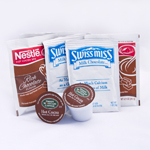 Our selection of major-brand cocoas include regular, no-sugar added, and marshmallow options. Valley Coffee offers a large assortment of sports drinks by the case. Ask us about our selection of Gatorade™ to keep your staff hydrated in the heat of the San Joaquin Valley summer. 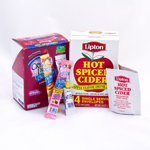 Flavored beverages and cider round out your break room beverage selection. Crystal Light in assorted flavors for the summer and Hot apple cider in the winter. Valley Coffee has you covered.